Per his military service record (regimental no. 4751), Reginald Arthur Cowell was born at Ermington, N.S.W. He gave his age as 19 years 5 months, his marital status as single, and his occupation as nurseryman. His description on his Certificate of Medical Examination form was height 5 feet 8 inches tall, weight 132 lbs., with a sallow complexion, brown eyes, and dark brown hair. His religious denomination was Church of England. He claimed that he had no previous military service. Reginald Arthur Cowell joined the Coo-ees at Parramatta. The Coo-ees had held a recruiting meeting in the Park at Parramatta on the evening of the 10th November, where it was reported that 41 men had offered themselves as recruits. He completed his medical examination at Parramatta on 10th November 1915, and was attested by Lieutenant R. Howe at Parramatta on 11th November 1915. The Cumberland Argus and Fruitgrowers Advocate reported on 11th March 1916 that a send-off had been given for Private Reginald Cowell the previous Friday ‘who is leaving with the Coo-ees this week for the front’, and that he was presented ‘with a silver-mounted pipe, tobacco pouch and silver pencil’. On his embarkation roll his address at time of enrolment was Excelsior Avenue, Castle Hill, N.S.W., and his next of kin is listed as his father, W. A. [William Arthur] Cowell, at the same address. On 8th March 1916 Private Cowell, along with many of the other Coo-ees, departed Sydney on the HMAT A15 Star of England, and arrived in Egypt on 11th April 1916. On 7th June 1916 Private Cowell left Alexandria aboard the Transport Ionian bound for France, and he arrived at Marseilles on 14th June 1916. Private Cowell, (along with several other Coo-ees, including Privates Watson, Easterbrook, Healey, and Mason), marched into the 13th Battalion on 19th August 1916 when it was resting and reorganising at Pernois, France. On 23rd September 1916 the 13th Battalion was manning the front line in the vicinity of Voormezeele, Belgium when Private Cowell was transferred to the 4th Division Light Trench Mortar Battery. On 25th September he was taken on strength of the 4th Division Light Trench Mortar Battery in the vicinity of Voormezeele, Belgium. On 11th April 1917 the 4th Division Light Trench Mortar Battery was involved in the attack on the Hindenburg Line in the vicinity of Bullecourt, France, when Private Cowell was wounded in action, receiving at shrapnel wound to his face. He was evacuated to the 4th Australian Field Ambulance. He was then moved back to the 9th Casualty Clearing Station. On 12th April he was placed aboard the 11th Ambulance Train. He was admitted to the 1st General Hospital at Rouen on 13th April 1917. 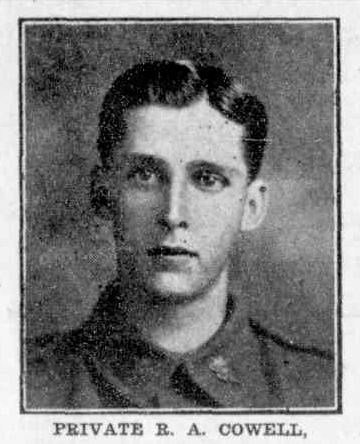 On 28th April 1917 Private Cowell was discharged to Base details and sent to the 4th Australian Division Base Depot at Le Harve, France. On 22nd June 1917 Private Cowell was charged with being absent without leave from Sick Parade. He was awarded forfeiture of two days pay. On 1st July 1917 Private Cowell departed the 4th Australian Division Base Depot to return to his unit. He joined the 4th Division Light Trench Mortar Battery on 5th July 1917 when it was manning the front line in the vicinity of Ypres, Belgium. On 19th October 1917 Private Cowell was with the 4th Division Light Trench Mortar Battery manning the front line in the vicinity of Passchendaele, Belgium, when he was wounded in action for the second time, receiving a shrapnel wound to his right eye. He was evacuated to the 4th Australian Field Ambulance. On 26th October 1917 he was discharged and returned to his unit in Belgium. On 5th September 1918 Private Cowell was sent to England on leave. He returned to his unit in France from leave on 23rd September 1918. On 30th January 1919 Private Cowell was sent to the Australian Base Depot at Le Harve to begin his return to Australia. He left Le Harve on 10th February 1919, and arrived at Weymouth in England on 11th February 1919. On 15th February 1919 Private Cowell was admitted to the Fovant Military Hospital seriously ill with Broncho Pneumonia. On 27th February 1919 he was transferred to the 1st Australian General Hospital at Sutton Veny, England. He was discharged from hospital to the 3rd Training Brigade on 15th March 1919. Private Cowell departed England aboard the H.T. Commonwealth bound for Australia on 13th April 1919. He arrived in Australia on 12th June 1919, and was discharged on 17th October 1919. This entry was posted in Recruits and tagged HMAT A15 Star of England, Parramatta recruits, Reginald Arthur Cowell. Bookmark the permalink.